October 28, 2014 October 29, 2014 / .|k|. Martha Stewart has instructions for these adorable animal night lights and I just had to make them for my nieces and nephew. They are not babies, but they love animals and I thought it would be a fun gift for them. As with all projects that I do, I ended up tweaking it to fit what I could find/what I thought made more sense. I have three nieces and one nephew and rather than making just one or two lights, I decided to make one for each of them. Good ole Martha only provided a template for two animals, a turtle and an elephant. I decided to also do a whale and a pig. I forgot to take pictures of the process with the first three, but one of the balloons popped during the first step so I’m doing a (mostly) step by step photo tutorial of that one. I found a wire basket at one of our local thrift stores for about $5. Martha says to use an 8″ diameter round lampshade bottom wire but this was much cheaper. I had originally tried to just buy a roll of wire but to get it exactly circular and lying flat was not going to happen. So I used the basket, stripped the plastic off, use a wire cutter to separate each ring, used the file to get the nub down to the ring, and then used the clear nail polish to keep it from rusting. I learned with the other three that the exposed metal rusts. Not that it matters in the end. But we’ll get to that. 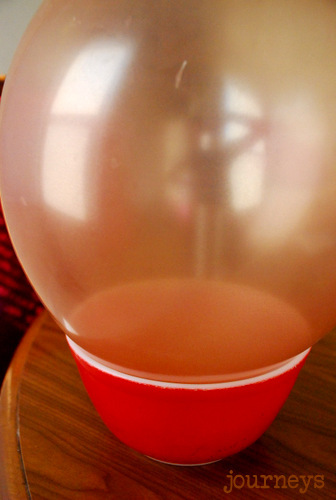 Next, I blew up a balloon (from the Dollar Tree) and placed it in a bowl to keep it upright. Removing the ring on the balloon, I placed the cheesecloth over the balloon then pressed the cloth over the oil and made sure to smooth out any wrinkles. Then I placed the ring back over the cheesecloth. I trimmed the cheesecloth close to the edge of the ring, but left enough to fold over the ring. 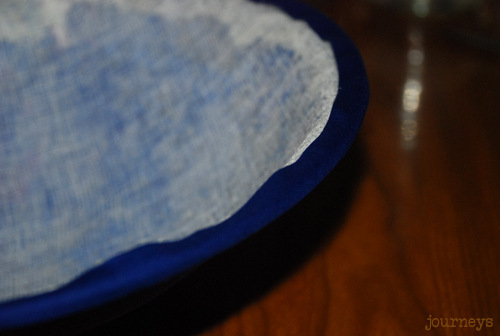 I used this cornstarch homemade fabric stiffener and coated the cheesecloth with it, all the way to the ring. Once it had been completely covered, I folded the edges of the cloth up and over the ring, brushing upwards to secure the cloth. Then I let it dry for over 24 hours. I ended up putting it in our bathroom since it’s one of the coolest rooms. I was afraid that the other one had popped because it had gotten too warm. This one had no such problems. Once it was dry, I used this cooked flour homemade paste for the paper mache (PLEASE, make sure to put salt in when making the paste because it might mold, which you can see in the turtle picture below). Before placing the tissue paper, I lightly coated the mold with the paste. Tearing off pieces of tissue paper, I layered the mold, making sure that the whole surface was covered, all the way to the edge. I did several layers so that the cheesecloth couldn’t be seen. Using a hot glue gun, I went slowly around, overlapping at the end and gluing down the underside as well. Lastly, I used the hot glue gun to attach the tail and water spout. I used a sharp knife to poke a slit in the top and then made the slit just long enough to fit the spout through, folding and gluing the extra paper to the underside of the mold. The tail does have a v slit so that it would curve up and out from the body. In fact, the head and tail of the turtle and the trunk of the elephant also have this feature (if you look at the template on Martha’s website, you’ll see what I mean). It allowed me to more easily attach the paper to the rounded side of the mold. I used the bottom of a paper cup for the pig nose. I cut slits all around the sides (like a fringe) and folded them inward, putting the hot glue on the concealed flaps. The cups I got from the Dollar Tree happened to be the exact same color as the base tissue paper (I used a darker shade of pink for the first few layers and then used a lighter shade over that). I used the paper mache paste to cover the bottom of the cup (which was originally white) and then drew the dots on with a sharpie. I think it’s pretty obvious that the tail is a pipe cleaner. Here are the lights I used; I got them at Bed Bath & Beyond. Martha’s instructions include Popsicle sticks for legs since the lights she uses have a cord. I found these to be perfect since they are LED and they sit right under the domes. And here they are in all their lit-up glory. I’m really happy with the variation in colors.